Self published in 2018 by TL Music Lessons. Guitarists wanting to learn how to play guitar solos and improvise along with songs. Guitar teachers can print the book or single sheets for their students. Guitarists can teach themselves how to play the 5 minor pentatonic scales by following the book. The aim is to be able to do this from memory by the end of the book in various keys. Guitarists on Grade 3 and above will find the scales useful for soloing. The 5 scale shapes are required for Grade 5, and for some syllabuses they are required for Grade 4. This minor pentatonic scales ebook is a compilation of 9 years of preparation work teaching guitar to a wide range of abilities. After trying many ways of teaching scales to students and moving them on to improvising and soloing, I have developed this exercise ebook to really get to grips with these 5 scale shapes. If you follow the whole ebook and spend time on each sheet there is a strong chance of being able to use these scale shapes from memory for improvising and soloing. I recommend spending about a week’s worth of practice on each sheet in the book. Really focus on that sheet for 3 or 4 practice sessions. It’s going to take you 20 weeks to do that, so you might want to move through it quicker, but I recommend doing that as you progress further through the book. Start out slow and then once it starts to click and you get used to the shapes then you can spend less time on each sheet. Make sure to follow the repeats on each sheet, which usually say to repeat the sheet twice. You are welcome to play more than twice though, or don’t do the repeat if you only have a short time to practice. The finger suggestions are a guide to what I recommend to my students. There are different ways of playing the scales so it’s ok to do what works for you. Just don’t use 1 finger for all of it! Younger players think it’s faster at first, but it’s really not in the long run. I remember one student that I had to battle with for ages to agree to use more than 1 finger on her scales and then after a few weeks of practicing with all the fingers, she found it funny because it was much quicker and easier than using just one finger. 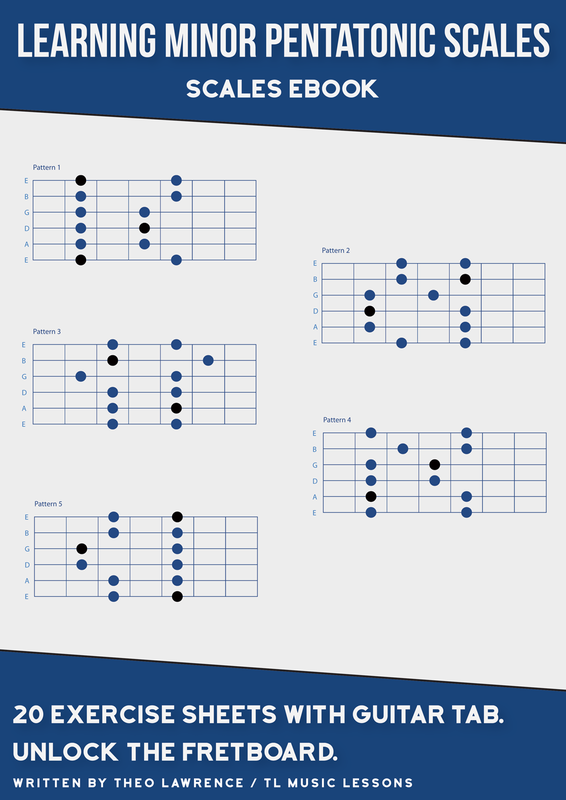 The guitar tab sheets have been created using Guitar Pro 7 and the scale shapes and cover were created using Adobe Illustrator. There is also a series of free posts featuring some of the minor pentatonic scale exercise sheets.